There is just so much to do! We all have goals in different areas, along with many responsibilities that rule our day to day lives. Most people have mental to do lists a mile long and get frustrated with their apparent lack of progress in checking things off that list. Today we are going to discuss an oldie but a goodie when it comes to prioritization. 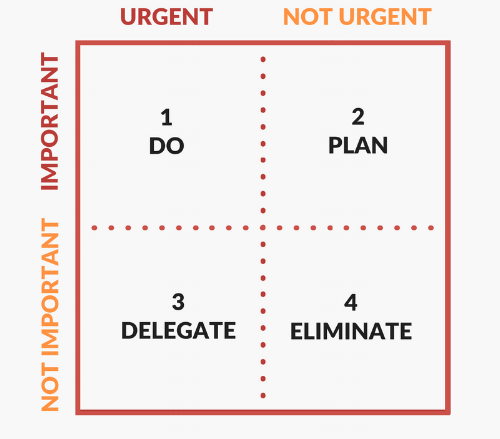 First outlined by former president Dwight D. Eisenhower, the decision matrix you see below is an excellent way to see what you should truly be working on right now. Important: A task that works toward achieving your goals. This could be something like working out, which is good for your health. It could be reading to gain knowledge in something that can help you at work. It could be getting your IRA opened so you can begin saving for retirement. Urgent: Something that needs your attention now. This could range from a crisis to a notification on your phone. Anything that you feel must be done today, or this week, falls in this category. As you can see, some things overlap. If your spouse is in a car accident, that is clearly both important and urgent. However, if a telemarketer calls your cell phone each day, that is urgent, but not at all important. And back to opening that IRA you've been putting off, while it is quite important, there is no urgency to it. Finally there is mindlessly scrolling the web, playing games on your phone and other things that are, you guessed it, not important and not urgent! As you can see in the matrix up above, each category is treated differently. For tasks that are both Important and Urgent, you should do those now. They are the best use of your energy as they are timely and move you closer to your goals. For things that are important, but not very urgent, you must plan on time to do them. Since the sense of urgency for these tasks will never force you to do them, you must make them a priority and find time to complete these tasks. For the last two sections, tasks that are unimportant to you, you either need to eliminate them completely or try to find a way to spend as little time as possible on them. That could mean delegating them to someone else. Often, when we have a lot to do with no clear starting spot, we find ourselves wasting time and procrastinating. While this gives our brain a short term respite, it leaves us feeling more stressed when the same important items remain undone. By prioritizing important items first, we may have time for those unimportant tasks after all!